Engrave on our professional products! Salon logos, Academy logos, or simply a name. Searching for that perfect gift for your favorite Stylist, Nail Tech, or MakeUp Artist? A personalized gift from you will stay with them through their careers. Salons, clients want pro products in their homes. Personalize with your logo and advertise to your clients daily to come in for that color or cut. 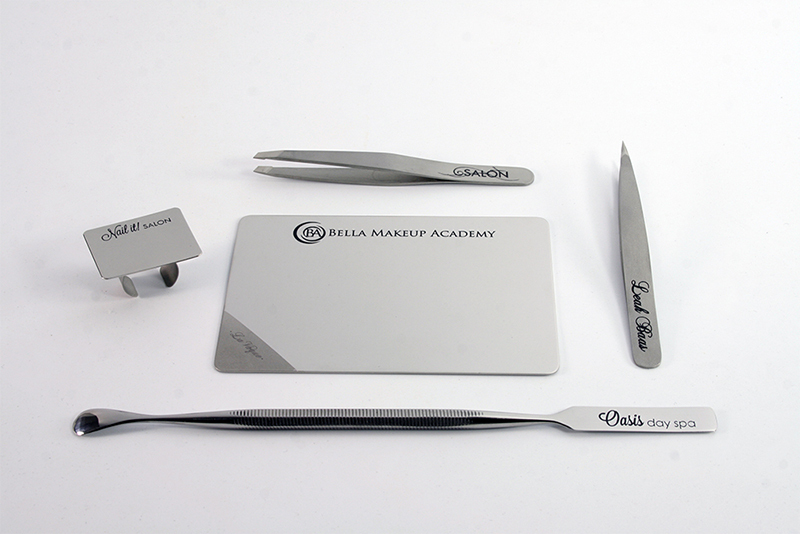 Academies, these stainless steel pro products with your logo will be with your students for a lifetime. Retail Display options. Holds 24 pieces. - Email us at sales@lavaqueprofessional.com with suggested order quantities, products, and logo/or text name. - Logo requirements are .eps or .ai files. For text name: files are not needed, just suggested font style. - Upon logo/name approval we will provide a proof of your logo displayed on the products for you to approve. - Once proof is approved, we will begin engraving the products with your custom logo/name. Note: We are adding your logo to our current products which are marked with a LaVaque logo. All products will be co-branded with LaVaque logo & your custom logo. For products exclusively with your custom logo & without LaVaque logo, please email for a quote.